10W Mini Sanwo Bluetooth Speaker Sound Bar with Subwoofer Stereo sound, Make you have a wonderful hearing experience, Enjoy your favorite Music, Movie. ◕‿◕ When the speaker be connected to your TV, Please make sure your TV has a 3.5mm audio output, If your TV has it, Please prepare a 3.5mm AUX Cable to connect the speaker. ◕‿◕ Devices does not connect to Bluetooth? ♻️ Firstly, you should check Whether there is sufficient power. ♻️ Secondly, does any others device connect the speaker? you can try double-click the pause key to interrupt the Bluetooth connection. ♻️ Finally, due to Apple mobile phone system update will lead to the connection is not on, you can try to restart the phone. ✊ ✊ ✊ CUSTOMER GUARANTEE - Our goal is to provide you with a quality product. We aim to make you happy with your purchase; However, if you're not completely satisfied, then CONTACT US and we will give you refund within 90 days of purchase or replacement. 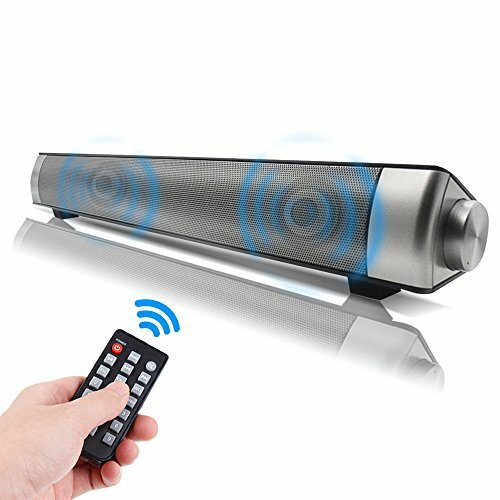  ❤️Bluetooth Function Available: Support devices with Bluetooth, Such as Smartphones, Computer, MP3/MP4 and TV.Powerful Stereo Speaker ；Enjoy the stereo booming sound with an high quality sound bar. Feel the real scene of your favorite movies, shows and sports with dramatic bass.  ❤️Attention Please: When it be connected to your TV, a AUX Cable(3.5mm audio output) is needed. Before purchasing, PLEASE help to confirm that your TV or digital products do have 3.5mm AUX output or RCA output.NOTE: "When connecting your TV" First, you have to make sure your TV must be audio output Second, if the TV is an audio input, you need to take the lotus line In the end, you need to set the TV's sound as "voice out loud."  ❤️The Speaker supports Bluetooth Mode(Wireless connection range: 10M), TF card Mode.Line in(AUX,RCA) Mode. No HDMI interface.  ❤️Compact home speaker soundbar system: Flexibly placing Fashion and portable design suits any home decoration. This TV speaker can perfectly sit flat below the TV screen or securely mount on the wall for a sleek and elegant home theater setup.Make you have a wonderful hearing experience, Enjoy your favorite Music, Movie. Relax your life!  ❤️Buit-in rechargeable battery, Please charge it by USB cord .You can control the speaker by the button or using remote controller. With this two ways, you can use it more conveniently and quickly. View More In Home Theater. If you have any questions about this product by sanwo, contact us by completing and submitting the form below. If you are looking for a specif part number, please include it with your message.